The other day I was faced with a head of escarole, a leftover ingredient from a pot of soup that I never made, that I had no idea what to do with. Roasted chicken sandwiches were already on the menu for dinner, so I figured I could easily turn the escarole into a side of some sort. My wife told me that her grandmother likes to saute escarole with a bit of oil and garlic (knowing her grandmother, I'm sure it is actually WAY MORE than a bit) and that it comes out bitter, but that's the way grandma likes it. I was into the oil and garlic, but not so much the bitter. After looking through a few recipes online, I decided that I would go with a quick braise, which hopefully would result in nice soft (but not mushy) greens, without me having to worry about burning garlic over a longer cooking time. Since I was having chicken, I chose chicken broth as a braising liquid. I decided to add some onions for a little sweetness to balance the bitterness of the escarole, and a little crushed red pepper for a touch of heat. It all came together quite nicely. 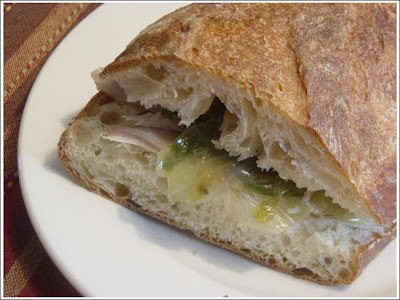 In a moment of inspiration, I did what my dad would probably do, and ended up putting the escarole on the sandwich, which was really nice. Start by cutting, washing well, and drying the escarole. Heat the oil over medium for a few minutes, then saute the onion, garlic, and red pepper for a few minutes. 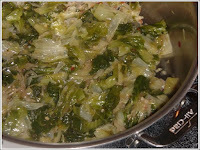 Add the escarole and braising liquid, stir to combine, cover and cook for 15 minutes. Give it a stir and it is ready to go. Makes a great side or sandwich topping. Use a non-meat based braising liquid for an all-veggie version of this recipe. If you would like the escarole to be a bit drier, uncover after 10 minutes and cook for the last 5 minutes uncovered to boil off some of the remaining liquid.